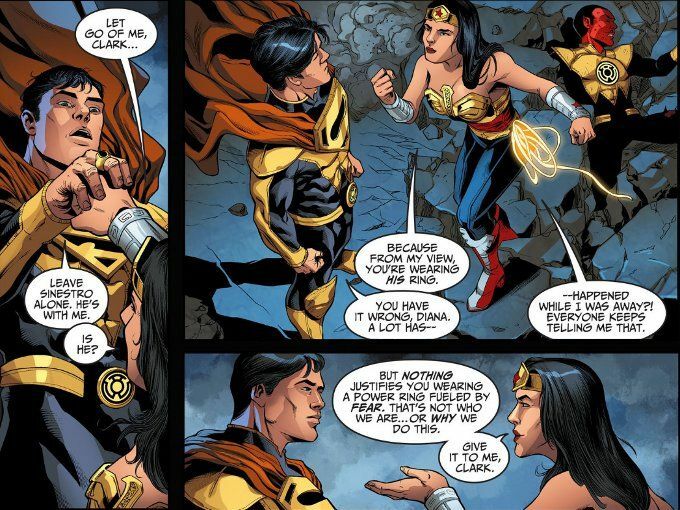 Spying a Sinestro Corps Ring on the unconscious Superman's hand, Wonder Woman - herself recently awakened from a magical sleep - assumes the worst. But the Man of Steel is down but not out! And with his fiercest and most stalwart ally by his side, he is ready to take the fight for the Earth to Batman. I have mixed feelings about Brian Buccellato's script for this issue. On the one hand there are many nice touches, such as Wonder Woman being the one to convince Superman that he should not need to depend on an artifact powered by fear. But there are also some things that leave me confused, such as the revelation that Superman doesn't need to sleep and that it was only his enjoyment of his dream of a better world that kept him from waking sooner. Yes, I know there is a case to be made based on past stories that Superman doesn't need to sleep but it still seems a bit jarring. Particularly when you consider that Batman of all people would have accounted for this in any plan to disable Superman! The script is also unclear about whether or not Superman woke through his own power or if, as Hal Jordan says, Ares was responsible. Indeed, last week's comic had Ares claiming he lacked such power and that it was Hera who awakened Diana. 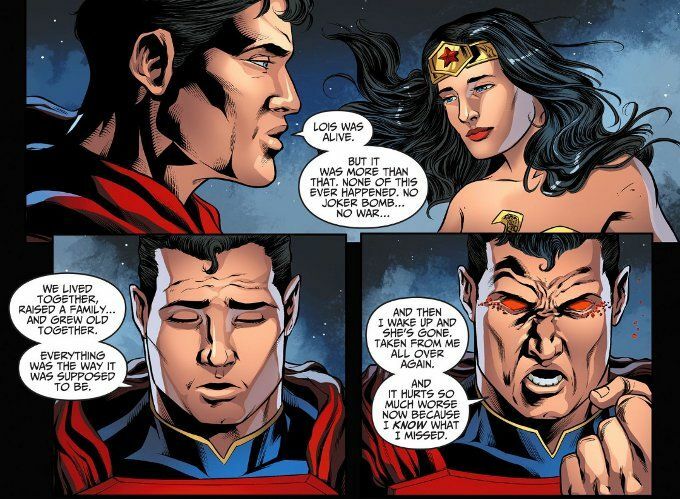 Perhaps this inconsistency is meant to signify Ares is up to something (indeed, I'd be willing to bet it since earlier in this series he was working to stop Superman from conquering the world) but it's very unclear if that is the case. The artwork by Sergio Fernandez Davila is similarly unbalanced. Davila's work is largely competent but many of his facial expressions and body positions are odd. Another problem is story flow and word-balloon placement within panels. At one point, John Constantine is seen shouting in surprise before Doctor Fate - who just appeared in the room - can say the words that surprise him.